5-Rib pattern designed for highway operations to improve on wear regularity, handling and wet traction. 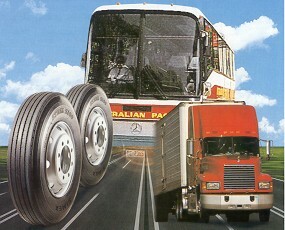 Suitable as all position tire for express buses as well as steer and trailer axle tires for trucks and hauliers. The pattern is made of two randomly arranged pitches (Chaos Theory) to minimize pitch noise generations and to ensure even wear. Deep sipes at 2nd rib to ensure good wet grip. A new concept profile called the Y Profile which allows the tire to achieve its natural inflated shape, minimize stress concentration at critical areas and achieve flatter tread profile to prevent shoulder wear. Thick rubber under patter to ensure retreadability. New tubeless bead profile to ensure proper rim tire fitment.